This is the final installment of the three-part series on library content marketing. The first post covered content marketing in business. The second post introduced goal setting and creating content. This final post discusses distribution and measurement. Don’t let your library’s content go unseen. Distribution is a very important component of a content marketing program. A distribution plan is the way to drive traffic to your content. Library content marketing is only limited by your imagination... but it is important to measure you efforts. You will want to know what your patrons do, and don’t, respond to, so you can put your time into the content that meets your goals. How do you measure content? 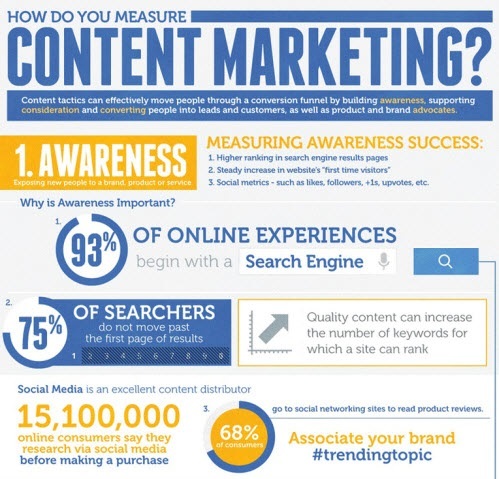 For more information on measurement, check out the How do you Measure Content Marketing infographic. Good content marketing is about the audience. Don’t worry about having the marketing budget of a Fortune 500 company. Think of your patrons and how to reach them with the resources you have.